FIGURE 1: Distribution of purple loosestrife in Canada and the United States. Adapted from USDA, NRCS Plants and Wilson et al. Purple loosestrife (Lythrum salicaria L.) is a perennial, rhizomatous forb that invades riparian areas and other waterways throughout most of the U.S. and southern Canada (Figure 1). The plant was first introduced into North America in the early 1800s as an ornamental and subsequently escaped cultivation. It is currently reported in all U.S. states, except Florida and Hawaii, as well as in nine Canadian provinces. FIGURE 2: Flowers are bright rose to purple and are the most identifiable characteristic of the plant. They are arranged on a spike. Photo by Steve Dewey, Utah State University, Bugwood.org. Purple loosestrife spreads primarily from seed, but new plants can also establish from root fragments and stem cuttings. Aerial shoots arise in spring from buds at the top of the root crown and can grow to more than 8 feet in height. Stems are square-shaped, five- or six-sided, and can be either smooth or covered with downy hairs. Bright rose to purple flowers are the most identifiable characteristic of the plant. Flowers are arranged on a spike, which can be a few inches to 3 feet long (Figure 2). The seed capsule is two-celled and contains very small seeds, with individual plants producing about 2.7 million seeds. Root crowns can spread to about 20 inches in diameter in a mature plant. Successful management of purple loosestrife requires integrating various control methods. Pulling and digging can be effective on individual plants that are not well established. Selective herbicides alone and in combination with biological control agents can effectively contain and control estab-lished infestations. Field studies conducted on purple loosestrife show that Vastlan® specialty herbicide at 1 to 1.5 percent solution (4 to 6 quarts of Vastlan per acre) will provide good control of loosestrife for up to one year following application (Table 1). from 30 to 50 gallons per acre. [ 2 ] Percent solution is based on “spray to wet” total application volume of about 100 gallons per acre. A non-ionic surfactant approved for use in aquatic environments should be added to the spray mixture at 0.25 percent volume to volume (1 quart in 100 gallons of water). Purple loosestrife often establishes and flourishes on non-irrigation ditches and seasonally dry wetlands. On these sites, Milestone® specialty herbicide applied at 7 fl oz/A, or at the spot treatment rate of 14 fl oz/A, will provide good to excellent control for a year or more after application (Table 1). The addition of 1 pint per acre of 2,4-D with Milestone at 7 fl oz/A provides additional control. FIGURE 3: Purple loosestrife control with Rodeo® at 6 quarts per acre (top) compared to Milestone® at 7 fluid ounces per acre (above). 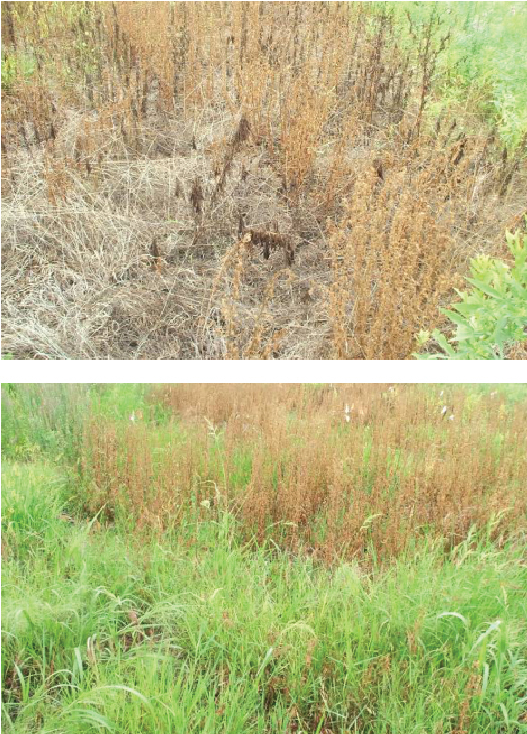 Both treatments provided good control of purple loosestrife, but Rodeo damaged desirable grasses. Photos by Dow AgroSciences. Rodeo® at 1 to 1.5 percent solution (4 to 6 quarts Rodeo per acre) will control purple loosestrife (Table 1). However, it is important to note Rodeo is non-selective and will injure or kill desirable grasses (Figure 3). Vastlan and Milestone are selective herbicides that will control broadleaf plants but will not kill cattail or desirable grasses at the recommended application rate. Herbicides should be applied at the bud to mid-flower growth stage. Plant foliage should be thoroughly wetted with the herbicide solution during application. Follow-up applications will be needed a year after treatment to control seedlings and any regrowth that may occur from mature crowns. Purple loosestrife is often difficult to locate until the plant blooms. Clipping, bagging and removing flower heads from the infested site may be necessary to stop seed production at mid-flower growth stage and beyond. Biological control agents alone and in combination with herbicides can be used on large, well-established purple loosestrife infestations. Four species of beetles were introduced into the U.S. and Canada to control purple loosestrife. Galerucella pusilla and G. calmariensis are leaf-eating beetles that affect growth and seed production by feeding on leaves and new shoot growth of purple loosestrife plants. Hylobius transversovittatus is a root-boring weevil that deposits its eggs in the lower stem of purple loosestrife plants. The flower-feeding weevil, Nanophyes marmoratus, reduces seed production of purple loosestrife. The two Galerucella spp. have been the most successful of the four agents in establishing and reducing purple loosestrife density in the U.S.
Loosestrife produces a vast quantity of seed that can germinate following herbicide application. Once the original infestation is controlled, new plants must be managed for several years. Long-term monitoring, vigilantly controlling newly emerging plants, and encouraging a desirable plant community will reduce reinvasion potential of purple loosestrife. Dow AgroSciences Unpublished Field Data. Lym, R. 2008. Purple loosestrife control with aminopyralid applied alone or with 2,4-D or triclopyr. Western Society of Weed Science Research Progress Report. ISSN-0090-8142. Pp 139-140. Merentz, Joe. USDA-APHIS, Personal communication. January 2018. Nelson, LS, KD Getsinger, and JE Freedman. (1995) Selective Control of Purple Loosestrife with Triclopyr. Wetlands Research Program Technical Report WRP-SM-4. Peterson, Vanelle. Field Scientist (retired). Dow AgroSciences. Wilson, LM, M Schwarzlaender, B Blossey and CB Randall. Biology and Biological Control of Purple Loosestrife. Forest Health Technology Team. Online bugwoodcloud.org/resource/files/6225.pdf. USDA, NRCS. 2018. The PLANTS Database (plants.usda.gov, 2 January 2018). National Plant Data Team, Greensboro, NC 27401-4901 USA. ® ™ Trademark of The Dow Chemical Company (“Dow”) or an affiliated company of Dow. Milestone and Vastlan specialty herbicides are not registered for sale or use in all states. Contact your state pesticide regulatory agency to determine if a product is registered for sale or use in your state. Label precautions apply to forage treated with Milestone and to manure from animals that have consumed treated forage within the last three days. Consult the label for full details. Always read and follow label directions. Active ingredients for herbicide products mentioned in this article: Milestone specialty herbicide (aminopyralid), Vastlan specialty herbicide (triclopyr-amine), Rodeo (glyphosate), and 2,4-D (2,4-Dichlorophenoxyacetic acid).